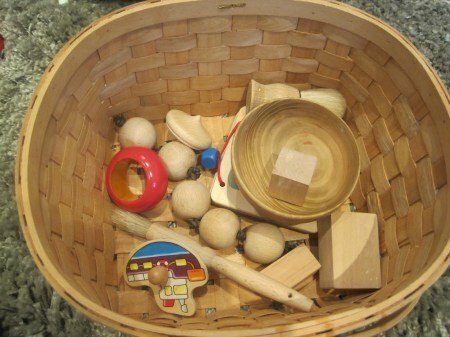 The treasure basket is not specifically a Montessori activity but it fits perfectly with the ethos of the Montessori education. In fact, Treasure baskets belongs to the heuristic play. I started to give a treasure basket to my children when they were able to to sit up by themselves (around 6 months old). At first, it was a mix of objects made of different materials. When they are older, I vary the kind of content to explore. In the playgroup, this area is also very popular with the older children as they can imagine whatever they want with the content of the basket. Adding some kitchen paper holder and rings, bracelets of all kind is also fun and note the natural items such as starfish or big shells. Treasure baskets to be found here! These are a great idea. I know my sons childminder uses these with the younger kids in her care and like you say the older kids love them too. We used to do lots of these when my girl was a similar age and now we are onto busy boxes – fab ideas! These are such great ideas i wish I had started doing treasure baskets a bit earlier with my son. At 2 he does still love this kind of thing though. Such a lovely idea to fire their imaginations! My son is older now, but this would have been right up his street. Such a lovely idea! I never did this but I wish I had! I have worked in those types of nurseries before and treasure baskets were definitely a common feature. This looks fantastic! My kids would enjoy playing with a treasure basket. Thanks for this idea.